COMING SOON…the Journal of the International Qur’anic Studies Association, Volume 1 (2016). See pricing and details below. Members will receive FREE online access to JIQSA. Edited by Werner Kelber and Paula A. Sanders, this volume is the proceedings of an April 2008 conference convened at Rice University that brought together experts in the three monotheistic religions of Judaism, Christianity, and Islam. The papers discussed at the conference are presented here, revised and updated. The thirteen contributions comprise the keynote address by John Miles Foley; three essays on Judaism and the Hebrew Bible; three on the New Testament; three on the Qur’an; and two summarizing pieces, by the Africanist Ruth Finnegan and the Islamicist William Graham respectively. The central thesis of the book states that sacred Scripture was experienced by the three faiths less as a text contained between two covers and a literary genre, and far more as an oral phenomenon. In developing the performative, recitative aspects of the three religions, the authors directly or by implication challenge their distinctly textual identities. Instead of viewing the three faiths as quintessential religions of the book, these writers argue that the religions have been and continue to be appropriated not only as written but also very much as oral authorities, with the two media interpenetrating and mutually influencing each other in myriad ways. 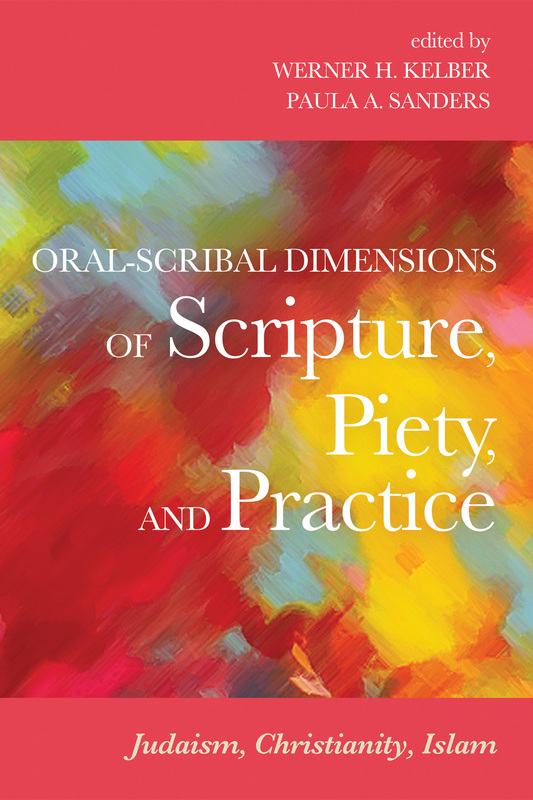 Oral-Scribal Dimensions of Scripture, Piety, and Practice has been published by Wipf and Stock Publishers and is available for purchase from their website. Six hours and thirty minutes is the duration of the new seven part documentary series on Jesus and Islam. The film Jésus et l’islam / Jesus und der Islam is presented in three versions (French, German and English) and features twenty six academic specialists from around the world–including several current and former IQSA members. The specialists include historians, philologists, theologians, archeologists, experts on manuscripts and other subjects. The film was directed by Jérôme Prieur and Gérard Mordillat and is a production of Archipel 33, ARTE and in collaboration with the Centre National du Cinema and the Bibliothèque Nationale. The documentary film was aired the week of December 8 and has been widely acclaimed in the French and German media. The film itself was in production for years, where directors Prieur and Mordillat methodically crafted a documentary exploring the role of Jesus in shaping Islam. The most important text for consideration, therefore, was the Qur’an–Islam’s holiest scripture and oldest historical document. In doing so the directors have asked the experts questions about the distinctly Islamic theological perspective on Christ and how and why it differs from Christianity. As the film demonstrates answering such questions can be complex and even controversial. Therefore, it also introduces viewers to the different academic schools (traditionalist, revisionist or otherwise) and their perspectives on the Qur’an, Jesus and Muhammad. 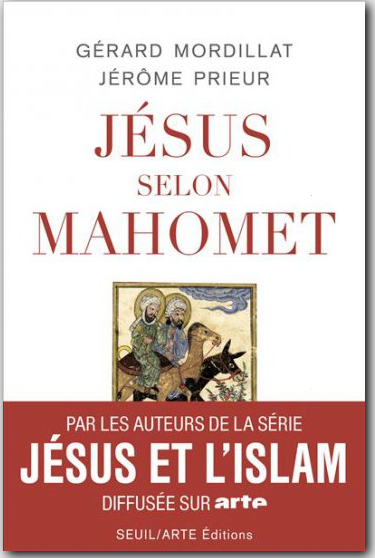 The seventh part of the series also inspired a book, Jésus selon Mahomet,in which the directors discuss their own views and perspectives. 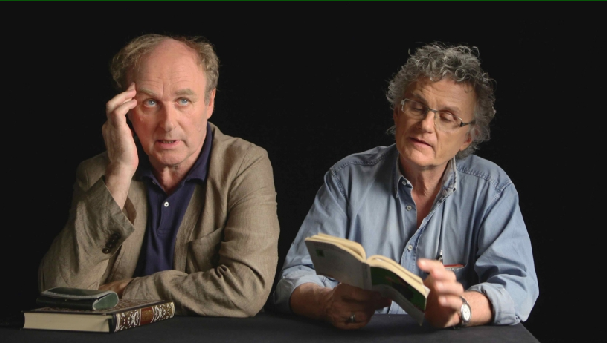 Prieur and Mordillat are seasoned writers and film directors who, among other things, specialize in documentary films on the history and formation of the Abrahamic religions. Their earlier works include Corpus Christi, L’Origine du Christianisme and L’apocalypse. There will be an exclusive, members only screening of Jesus and Islam at the next IQSA annual meeting on November 18-21, 2016 in San Antonio, Texas, USA. CLICK HERE to renew your IQSA membership for 2016 NOW! …the Qur’an should be appreciated in light of its conversation with earlier literature, in particular Biblical literature…This argument necessarily involves an examination of both the relationship of Muslim exegetical literature to the Qur’an and the relationship of the Qur’an to Biblical literature. Sūrat al-Masad (Q 111) offers a valuable example for how a Biblical perspective can augment our understanding of the Qur’anic text. The text of the sūrah names its main character Abu Lahab, and mentions that he has a wife, but does not provide any further identifying information. Only extra-Qur’anic literature can give us more details about who he was. In this blog post, I compare how he may be identified through the Islamic literary sources and through the Hebrew Bible. Image courtesy of Vince Pahkala; accessed from Wikimedia Commons. Abu Lahab, meaning “the father of flame,” is identified as the uncle of the prophet Muhammad, ʿAbd al-ʿUzza ibn ʿAbd al-Muṭṭalib, nicknamed Abu Lahab on account of his reddish complexion. He is said to have been a rich and proud man, and he and his wife Umm Jamil, sister of Abu Sufyan, are depicted as fierce enemies of Muhammad and the early Muslim community. There are many anecdotes in the Islamic literary sources about their verbal and physical attacks on the prophet. Some Qur’an commentators say that Umm Jamil used to litter Muhammad’s path with harmful thorns of twisted palm leaf fibres, and that this is the historical context for the final verse of Sūrat al-Masad: “Will have upon her neck a halter of palm-fibre” (Q 111:5). In searching the Hebrew Bible for a wicked man whose name resembles Abu Lahab, one finds Ahab (Hebrew: אַחְאָב), the seventh kings of ancient Israel (r. ca. 885-874 BCE), son of King Omri and husband of Jezebel of Sidon. We could read “Abu Lahab” alternatively, and without substantial change, as “Abu’l-Ahab,” father of Ahab. According to the Hebrew Bible, the father of Ahab is Omri, who is described in 1 Kings 16:25 as having acted “more wickedly than all who were before him.” His son Ahab, in his own time, “married Jezebel the daughter of Ethbaal king of the Sidonians, and went to serve Baal and worshiped him . . . Thus Ahab did more to provoke the Lord God of Israel than all the kings of Israel who were before him” (1 Kings 16:31-33). 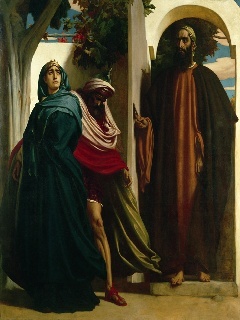 Frederic Leighton, “Jezebel and Ahab,” ca. 1863, Scarborough Art Gallery; image from Wikimedia Commons. As for Jezebel, it is said that she ordered the killing of prophets (1 Kings 18:4). The prophet Elijah escaped her persecution and with God’s command confronted Ahab with a challenge to the priests of Baal: “You call on the name of your god and I will call on the name of the Lord; the god who answers by fire is indeed God” (18:24). The supporters of Baal called upon their god to send fire to consume their sacrifice, but nothing happened. When Elijah called upon the name of the Lord, fire came down from heaven immediately and consumed their offering. Eventually Ahab in killed in battle, and when Elisha, successor to the prophet Elijah, anoints Jehu king of Israel, the latter had the house of Ahab killed. Jezebel was captured by her enemies, thrown out of a window, trampled by a horse, and her flesh eaten by dogs. May the hands of Abu Lahab [Abu’l-Ahab] be ruined and ruined is he. The biblical story of Ahab fits well with this verse, in both linguistic and narrative/thematic terms. The father is invoked for ruin. Omri was the first person to introduce the worship of Baal in Israel, for which his progeny are to be ruined. In Qur’anic Arabic terminology, hands (here, yadā) are symbolic of power and of progeny. The fate of Omri’s progeny is pronounced not so much in the tafsir literature as in the biblical texts. His wealth will not avail him or that which he gained. The Ahab of the Bible seems to have had greater wealth than the Abu Lahab of Islamic tradition; his great wealth failed to prevent his demise by God’s command. He will [enter to] burn in a Fire of [blazing] flame. Hellfire is an eschatalogical concept associated with unbelief, especially with the sort of idolatry instituted by Omri and Ahab. And his wife [as well]—the carrier of firewood. 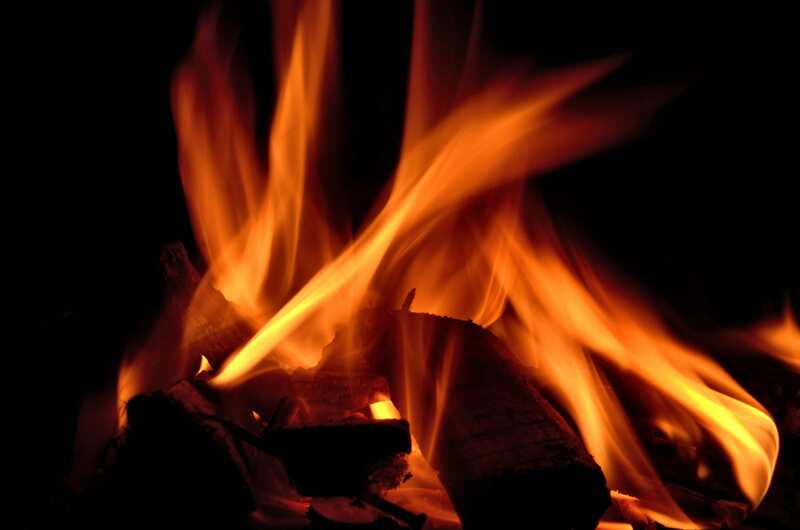 The feature of firewood (ḥaṭab) is key. The challenge at Mount Carmel consisted of sacrificing bulls on firewood in order. We can imagine Jezebel supporting the Baalist priests by collecting the best woods to burn the sacrifice easily. The image of Jezebel carrying firewood makes more sense of this verse than that of Umm Jamil dumping thorns. Around her neck is a rope of [twisted] fiber. Traditional exegetes struggle to explain the meaning of the rope of palm-fiber (masad). It may be better understood in light of the Jezebel story. The term masad appears to be a hapax legomenon in the Qur’an that might have a Hebrew root and be related to Jezebel’s violent death. This term begs for further examination along these lines. * Ercan Celik is a certified public accountant in Turkey. The International Qur’anic Studies Association is excited to share with its members its new Qurʾan Seminar website! The Qurʾan Seminar is a research project of IQSA dedicated to collaborative study of selected Qurʾanic passages on themes of central importance to the text itself, which collectively represent a diversity of literary genres, and which are of interest to the academic field of Qurʾanic Studies. Access to Qur’an Seminar is open to IQSA members only. To become a member, click HERE. Once you are a member and have paid membership dues, follow the instructions for accessing Qur’an Seminar. 2. Click Log in/Sign up located on the top right hand corner. 3. Complete the required field under Have an account? Sign up. Click Login. The password you choose can be the same as your IQSA member login or a new one. 4. You will receive an email message which will confirm your registration. Please do not forget our first Panel, Keynote Lecture and Reception all taking place on Friday, Nov 21 (one day before the official start of AAR or SBL). Our Keynote Lecture is on “Qur’anic Studies and Historical-Critical Philology. The Qur’an’s Staging, Penetrating, and Eclipsing Biblical tradition,” and will be delivered by prof. Angelika Neuwirth, with a Response by IQSA president, prof. Andrew Rippin at 4:00-5:15 pm in San Diego Convention Center (CC), Room 23 C (Upper level). All Friday events are FREE & OPEN TO THE PUBLIC. Furthermore, I invite all IQSA members to fulfill their duty as members by attending our first ever Business Meeting, Sunday, Nov 23 at noon in the San Diego Convention Center (CC), Room 24 C (Upper Level). Finally, if you have not already please visit IQSAWEB.ORG in order to become a Member for 2014, subscribe to our Blog and join the private IQSA Discussion Group. On behalf of the Board of Directors, Standing Committees and our partners we would like to express our deepest gratitude to all friends of IQSA, and we look forward to seeing you this Friday. 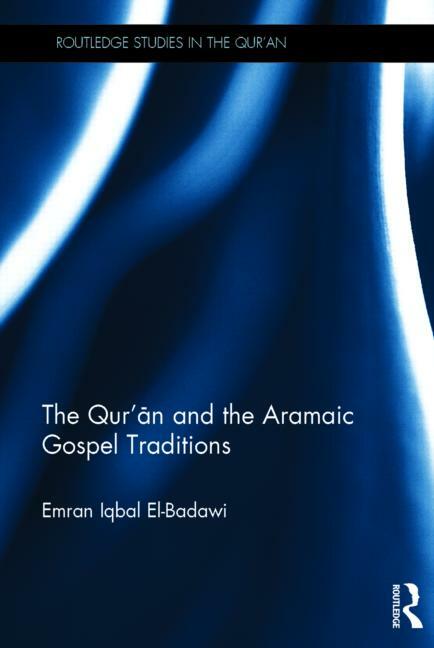 A new book by Emran El-Badawi on The Qur’an and the Aramaic Gospel Traditions has been published this month. This book is the thirteenth of the Routledge Studies in the Qur’an series, edited by Andrew Rippin. This book is a study of related passages found in the Arabic Qur’an and the Aramaic Gospels, i.e. the Gospels preserved in the Syriac and Christian Palestinian Aramaic dialects. It builds upon the work of traditional Muslim scholars, including al-Biqa‘i (d. ca. 808/1460) and al-Suyuti (d. 911/1505), who wrote books examining connections between the Qur’an on the one hand, and Biblical passages and Aramaic terminology on the other, as well as modern western scholars, including Sidney Griffith who argue that pre-Islamic Arabs accessed the Bible in Aramaic. The Qur’an and the Aramaic Gospel Traditions examines the history of religious movements in the Middle East from 180-632 CE, explaining Islam as a response to the disunity of the Aramaic speaking churches. It then compares the Arabic text of the Qur’an and the Aramaic text of the Gospels under four main themes: the prophets; the clergy; the divine; and the apocalypse. Among the findings of this book are that the articulator as well as audience of the Qur’an were monotheistic in origin, probably bilingual, culturally sophisticated and accustomed to the theological debates that raged between the Aramaic speaking churches. Arguing that the Qur’an’s teachings and ethics echo Jewish-Christian conservatism, this book will be of interest to students and scholars of Religion, History, and Literature. Emran El-Badawi is Director and Assistant Professor of Arab Studies at the University of Houston. His articles include “From ‘clergy’ to ‘celibacy’: The development of rahbaniyyah between Qur’an, Hadith and Church Canon” and “A humanistic reception of the Qur’an.” His work has been featured on the New York Times, Houston Chronicle and Christian Science Monitor. For complete product information on El-Badawi’s book please go here. * Accessed from the publisher’s product page.